When I got back from California, the weather in Chicagoland had turned to the chill of approaching winter. Never you mind that the Weather Channel is saying we are going to have an above normal temperature winter. It's still winter. There was a storm brewing in the Pacific which could, in 10 days, make life miserable for the mid-section of the country and parts of the Upper Midwest. In came the geraniums. Part of bringing them in is to cut them back and remove dead flower stalks and leaves. That's a half-day's job. 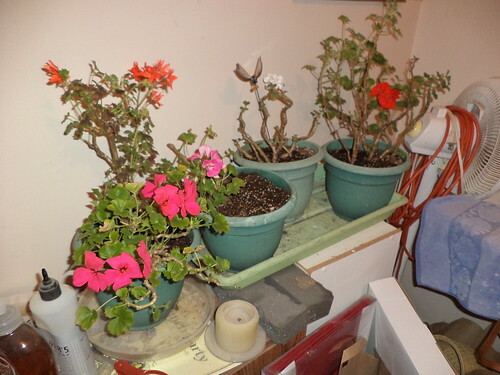 My kitchen smelled like geraniums for a time. I got them all moved to the back room where they have access to sunlight and I'll sort of remember to water them because that's where the litter boxes are. They look kind of sad, stripped of their flowers and slightly leggy until they send out side shoots and fill in the leaves. I wasn't paying a whole lot of attention to them until I came into the room close to Thanksgiving, about a week after getting them settled in the room. Oh my. Flowers. Deep pink, salmon, white and red. The large pink geranium; sort of the granddaddy of all of them, the very first one I ever bought a long time ago; doesn't fit over here. I still don't have it in a permanent winter spot. I took the other white geranium to the office where it's going to spend its days, permanently, in an east window. I water once a week; feed every other. They have adapted well. I look forward to a winter of occasional flowers. I need to get one of those deep purple geraniums next year. That would look outstanding with this group.